Snowed for 36 hours. It stuck to trees, such a pretty sunrise. Lemon yellow light over a white world. We got nearly a foot of snow. Heavy wet snow. It was warm and sunny today. Snow fell off the trees and metal roofs, ice turned to slush in the streets, and snow melted off decks and driveways. We are still in winter, but thinking of spring. We dare think of spring. The snow will melt and green will emerge. was great. 16 eager students. Wide variety of backgrounds, knowledge, and energy. They had excellent comments and questions. I was the first presenter in a series of wellness classes. One woman had tremendous energy and power. One man hugged me after class, long and hard. Like longer and harder than most social hugs. I had to wonder, was I returning hug with suitable enthusiasm? It was nice to get a hug like that. One woman had a sleeve of tattoos and was scented with aromatherapy oils, sweet and spicy. One woman's hands were hot with energy. One man came to show me his drawings: angels. He said he saw my aura: a brilliant white light, with some colors. He saw me surrounded by an angel. Hello, Uriel! Thanks for coming. Said the angel hovered over me as I did attunements, then folded up his wings and disappeared as soon as I was done. Some of the students already had Reiki. They added a few comments, and said I was teaching OK. Some of them had tune-up attunements. You know what I like about Reiki? Anyone can do it. There is no hierarchy, no chain of command, no organizational chart. Best part? We don't really do anything. I simply clear my mind and tune in to Reiki. I bring my best self: healthy, helpful, and ready to listen. Ready to be a vessel for the energy. No special equipment, no yearly dues. Just Reiki. And just Reiki is enough. Did 16 attunements tonight. More Reiki in our world. More love & light. Which do you prefer. Reiki practitioners can work directly on the body, or in the field, a few inches away from the surface of the body. Different sensations, same intention. Your thoughts? was offline for a few days. Some sort of glitch in the world of publishing. It's back and available. See? Click on the picture on the right. Thanks. There's a hurricane out at sea, Level 2 Hurricane. We're feeling the wind here, half an hour from the coast. Ripping winds that rattle the windows and send drafts across my floors. I go out to shovel snow. Blasting wind sweeps my hair around and pulls the breath from my lungs. I see whirling vertigos of snow, little tornadoes sweep across parking lots and driveways. The sky is blue and the sun blazing, but the wind. The giant swirl of wind. "If it looks ugly on the hanger, it'll look good on your body," said a young woman to her young man. Overheard as I was shopping for work clothes today. Getting my wish, it's snowing. But there are hurricane-force winds too. So a good day to be inside watching the swirling white and heaving branches. joyed at the prospect of winter vacation next week. I hope it snows every day. I want to go snowshoeing, skiing, skating, and sliding. The ice crystals felt like broken glass on my face so I turned my back to the wind. The drifts were 4 feet deep, up to my thighs, and I waded through to reach the snow scoop. I scooped the snow off the deck, dumping it in the backyard. The wind picked it up and spread it back on the deck. The snow came sideways, up the hill. It felt like the North Pole, with the wind blasting cold and full of snow. The wind scoured the roofs clean, dumping snow in front of doors and finding tiny cracks around storm windows- filling windows with snow and glazing the surface with a kaleidoscope of lacy crystals. Good news: had a great day teaching and laughing, and a productive planning meeting with my boss. Bad news: walked outside and it was cold; a biting breath-taking cold wind. Good news: going home to relax after a long day. Bad news: oh, look at that. A flat tire. urgh. Must drive to tire place further ruining probably ruined tire and plunk down mucho buckos for new tire. Good news: a gas station around the corner, air is $1; filled tire. Drove to tire place. More good news: no line. Got right in. Sat and graded papers. Bad news: it was cold in there and smelled like tires. I got chilled. Best news: they fixed my tire for free. There was a nail in the tire; they removed it and patched the tire. I drove over a nail, got to stop doing that. was in the email I received today. Evaluations from a recent talk. One member of the audience, in reaction to my presentation, wrote simply, "witchcraft." Should I take it as a compliment? I'd like to. I don't think it was meant as a compliment. How strange. 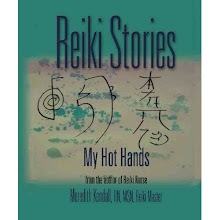 It was a stripped-down, medically-oriented, factual PowerPoint presentation on Reiki. There were quotes from Pamela Miles and summaries of research studies. There were photos of Usui, Hayashi, and Takata. There was a cute pic of a chihuahua getting Reiki: most people chuckled. There were objectives and references; it was scholarly. I never do, when I intend to help people and someone reacts with hostile negativity. I try to help people achieve their best health, without being pushy. I try to be as healthy as I possibly can. I ate kale today! I wonder which part of the presentation triggered this response. I wonder what "witchcraft" means to this person. I wonder. That's what guitarist Chuck Foster said at Kirtan on Saturday evening. He heard it from someone else, he said. It's winter, it's Maine, and I can still pick and eat the kale out back. I didn't quite pick it all last fall. I picked most of it. What's left is still good. It's in open raised beds. Frozen, fresh, crunchy, green, & sweet. Yesterday there was a cardiology conference at the local hospital. Open to the public. Expected audience: 80-100 local people. The crowd looked about that big. Wired up to a microphone and equipped with a slide advancer and a laser pointer, I addressed the crowd. I had a PowerPoint presentation and an index card with notes: "thank the organizers, introduce the Reiki practitioners." Eleven wonderful Reiki practitioners joined me. They circulated through the crowd as I spoke. People in the audience raised their hands if they wanted Reiki. They laughed at the slide of a chihuahua getting Reiki, smiling a big dog smile. Practitioners left business cards and pamphlets on tables in the lobby; people scooped them right up. 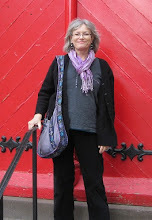 I hung out in the lobby afterwards, chatting with my dear Reiki friends. Lots of people from the audience came up to ask questions about classes and sessions. It was a fun morning. Went to Kirtan again last night. It's chanting and singing. Luckily there is enough noise that I can't hear myself sing. Pretty sure no one else can either. So I happily sing and chant, feeling the music in and around me. Last night there was a guitarist and a percussionist, both excellent, to my ears. Some people clap and sway. I usually sit very still, in my personal meditative bubble, but at one point last night I found myself slightly bobbing my head. I sang the songs all the way home.